Once in a while I have to break out of the North County bubble for a Lick the Plate adventure that takes me somewhere new and exotic, like Miramar. I say that in jest as Miramar is defined as a neighborhood in the northern part of San Diego that includes residential areas (if you look hard enough) but it’s mainly commercial and light industrial businesses. Miramar was the site of the real Top Gun made famous by the movie “Top Gun” in 1986. Anyway, there is a good chance you are familiar with many of the businesses there including many breweries namely Ballast Point Brewing that was founded in 1996 and eventually led to Ballast Point Spirits in 2008. Ballast Point Brewing was one of the first San Diego breweries to score big, being acquired by Constellation Brands for $1 billion. Following the sale, the distillery portion of the business was spun off and rebranded Cutwater Spirits which, in 2017, moved its operation to a 50,000-square-foot facility in Miramar. Soon after they opened up a tasting room and kitchen featuring lunch, dinner, cocktails, R&D spirits and retail shop. Now that we have the nutshell backstory taken care of, I should also mention that the distillery thing has been happening in Detroit for several years now, where I spend a considerable amount of time. My nephew Will is a partner in Detroit City Distillery and they seemed to have popped up all over the city, suburbs and in northern Michigan. None of them are quite on the scale of Cutwater though, which is a massive facility and has national distribution of their canned cocktails. I’m assuming that happened so quickly through their relationships forged by Ballast Point. 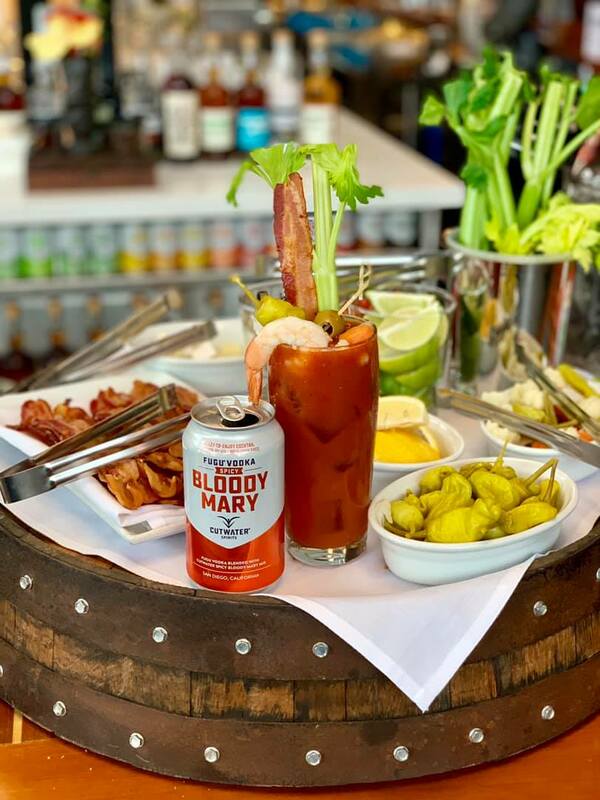 I’ve been aware of and a fan of their canned craft-cocktails that number around 15 and include everything from the Cutwater Whiskey Highball to their Cutwater Mild Bloody Mary and Cutwater Cucumber Vodka Soda. They are nicely convenient when the mood for a cocktail strikes and you don’t have the key ingredients or the space handy to mix one up. A nice example of this is the Cutwater Whiskey Lemon Tea that has their Black Skimmer Bourbon with subtle tea notes and sweet lemon that creates a refreshingly bright cocktail in the convenience of an already mixed can. Their full-on spirits line includes vodka; white, barrel-aged, spiced and cask-strength rum; gin; bourbon whiskey; American rye whiskey; and moonshine. Add in some specialty flavors and that rounds out their spirits line. Prior to a recent meal at Cutwater, I enjoyed a crafty and delicious whiskey-based cocktail. Speaking of the meal, it is a huge dining space and from what I’ve heard they fill it up on a regular basis. We started with the Chicken Legs with hot sauce expecting the appetizer size legs and to our surprise and delight three full-size, meaty legs arrived that could have easily been a meal for one. We also sampled the Sauteed Shrimp in Cutwater Spicy Bloody Mary Mix, fennel, garlic, onion, bacon and toasted cous cous and it was really good. The Fried Broccolini with gochujang aioli, Cutwater Whiskey Lemon Tea sweet soy sauce, green onions and togarashi was delish! My LTP new ingredient of the day is gochujang, which is a red chili paste that is described as savory, sweet and spicy fermented condiment made from chili powder, glutinous rice and fermented soybean … so now you know! Another starter that should appeal to those with Midwest roots is the Loaded Fries with pulled pork, cheese curd and gravy. 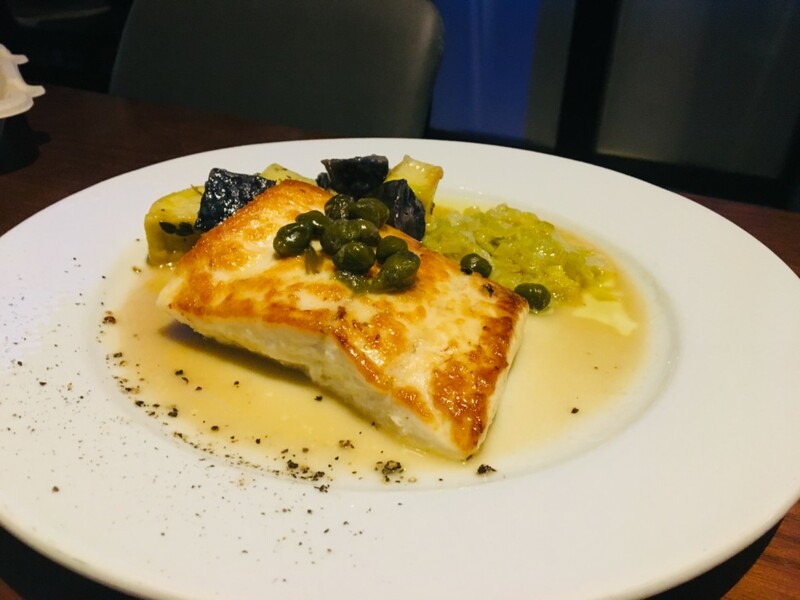 Given the sizeable portion of our chicken leg starter, we decided to split the catch of the day that was a beautiful portion of halibut with roasted purple potato, leeks and a brown butter-caper sauce. The main section has some nice looking dishes including the Roasted Half Chicken, Cutwater Burger and Pork Ramen. For dessert the Three Sheets Cheesecake with brownie crust, cream cheese filling, Three Sheets Spiced Rum, cherry ganache and almonds was just as it sounds, quite nice. Of course they have a full selection of crafty beer and a few wines to choose from but this is a cocktail-centric joint and that’s what I would suggest. I say joint but this is really a crazy beautiful building and definitely worth checking out. Free tours and premium tasting tours are offered daily where guests can view the production facility and learn about the spirits making process. 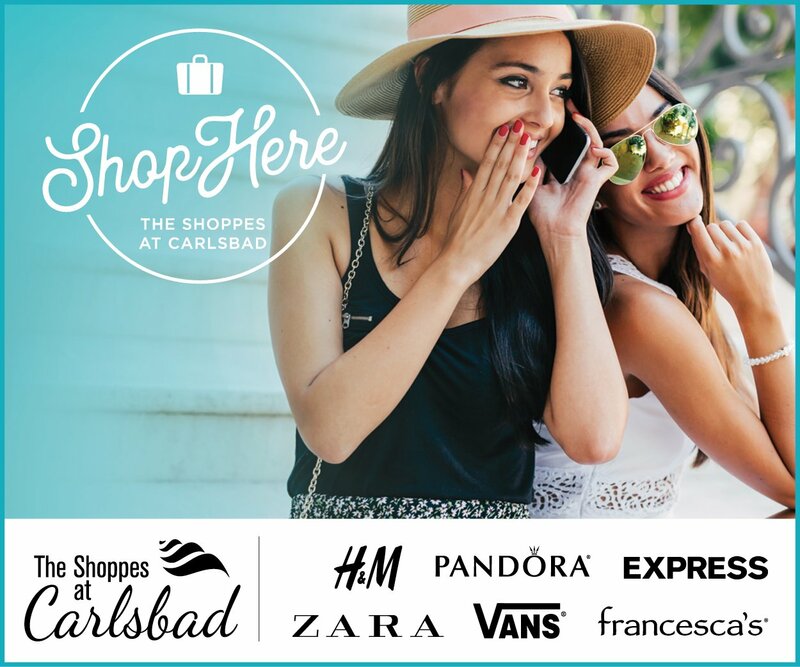 Find them at 9750 Distribution Ave. San Diego. Call (858) 672-3848 or visit www.cutwaterspirits.com.